It’s almost impossible to describe how joyous it is to watch a film like The Flight of the Red Balloon. It’s a masterpiece, the best film I’ve seen in the last 10 and more, and its power comes from the simplicity and beauty of its story, its images, and from the lives portrayed. I used to think that for a film to be powerful and profound it must be dark or ugly, downright depressing so it can easily move its audience, but that is an immature thought. The Flight of the Red Balloon is about the peaceful and hectic qualities of life that make existence such a magical thing. I can’t give a plot summary. It would sound boring, banal even, and may discourage potential viewers. Things happen in the film but they are elliptical, and a linear description would not serve the film well. It is told from the view point of a red balloon, and we are dropped into the story looking in on three very special figures. Fang Song, the Chinese film student studying in Paris; her new employer, Suzanne, a free-spirited mom; and Simon, her son, the child Song is now nanny to. I could describe the events overseen by the balloon but the film would seem insignificant. This is a film that has to be seen. It needs to act on our senses. Only then we can appreciate the experience. Suzanne is a performer. Her grandfather was a puppeteer and she now does the narration and voice work for puppet shows. She is a mess, a ball of energy with weird fashion and a wonderful personality. She is always losing things or forgetting appointments—she has so much to do, and yet the people around her she never forgets. She has an instant rapport with Fang Song. Immediately she trusts her son with the girl, has her make a key to their apartment. The film might exist in a hyper reality where things are far from perfect but they are still slightly untouchable. This might be what I loved about the film more than anything. It is liberating to sit back and have such a soothing, happy experience without guns, violence, cussing, and all the ugly things that most movies rely on for entertainment. The Flight of the Red Balloon is as aimless as a free-wielding balloon. Conventional screenwriting techniques would proclaim this structure a failure, and indeed if the screenplay read verbatim like the final cut of the film it would probably not be a good read. But this is a movie. It exists in sounds and images that create a great impression of life as I certainly would like to live it. Director Hsiao-hsien Hou has the eye and temperament of a master. He does not rely on typical, beautiful compositions or clean kept streets for beauty. Life in Paris is beautiful, or can be, just as it can be anywhere, and any pretense of creating artificial beauty is not needed. Life is beautiful as it is. This is not a film about nothing, or a slice of life. I think we have certain impressions of such phrases. 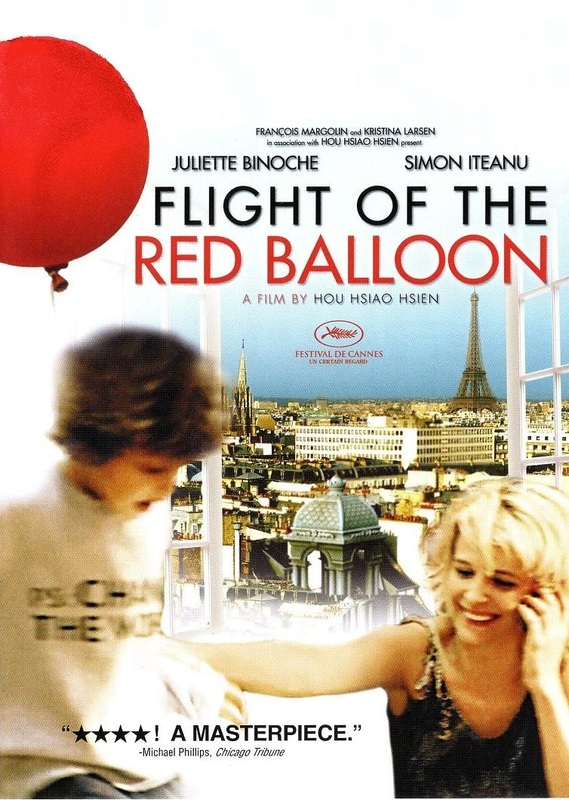 I would say The Flight of the Red Balloon is a film about living. Think of how many people we pass each day, how many names we’ll never know. We will hear snippets of conversation or create scenarios based on what we can see, but for all of it we are no better off than a shiny red balloon. The great surprise in this film is the character of Simon. It’s very tricky to create honest child characters. I think so many of us are disillusioned with life that we cannot recall what existing as a child was like. In American movies, young kids, ages 4-8, are blank-eyed, silent and morose things that are more creepy than enduring. Simon Iteanu is everything I would hope a little boy could be in real life: bright, inquisitive, interested in creativity, in cinema, painting, puppets; he sleeps with a stuffed bear and exists enough in the modern world to use a digital camera and play Playstation video games. He has answers to questions, insights and observations, like when Suzanne is arguing with a man on the phone who may or may not have been her lover or his father—we’re not privy to such information. Suzanne screams, “I need a man beside me and there is no one beside me.” Simon in the back seat says, “I am a man.” The delivery is much more charming than the words, and the little Simon Iteanu is superb. Juliette Binoche we expect a perfect performance from, Iteanu is a revelation. One of the greatest scenes I’ve ever seen in a movie is Suzanne’s final scene. She has just argued heatedly with a neighbor, slammed the door in his face and now sits teary-eyed before her son, Fang Song, and a piano tuner. The camera stays on Binoche’s face. She calls her son over to her, asks what he did in school. They hug and she smiles. Simon goes off to play his Playstation. Suzanne smiles serenely, still fighting back tears, shaken with anger as she asks the piano tuner if he’ll retune the piano okay. Binoche does something magical. Her expression, her attitude, her talent—I don’t know the right word, but this is a true moment of tranquility and it always makes the hairs on my arm stand. I can only describe moments in the film. There is not a thing wrong with it. I could detail every scene but a masterpiece like this is better off discovered fresh. I had such a profound reaction to this picture that I hope I am not overselling it. Subtle movies affect everyone differently and it simply moved me like few films have. I like to think the red balloon is watching all of Paris. Only occasionally does it appear at the window. Often it is floating in the sky. Think of the stories that exist in the film that we do not see. What does the red balloon know, and what other magic has it seen?